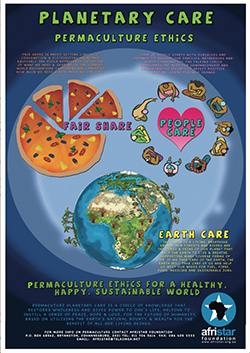 Permaculture is an optimistic, action-oriented approach to the environmental, energy, food, water and climate crisis the world is currently facing. It focuses on the small solutions that we can implement now, to save the earth & ourselves. Afristar Foundation utilizes Permaculture Design systems as the primary means of community based natural resource management. Permaculture is a successful, proven approach to designing sustainable systems. Its adaptability and emphasis on meeting human needs means that permaculture can be utilized in every climatic and cultural zone. Care for the Earth: The Earth is a living, breathing entity. Our forests and rivers are the lungs and veins of the planet that help the Earth to live and breathe, supporting many diverse forms of life. If we take care of the Earth, the Earth will take care of us, and help us meet our needs for fuel, fiber, medicine and sustainable jobs. Care for People: Care of People starts with ourselves and expands to include our families, neighbors and wider communities. People care incorporates the need for communication, companionship and collaborative efforts to affect positive, lasting, earth-friendly change. Return of Excess to Care for the Earth and Care for People (Fair Share): Fair Share is about setting limits to consumption and distributing abundance equitably. Fair Share emphasizes the taking of what we need and sharing of the surplus while recognizing that there are limits to how much we need and how much we can take.